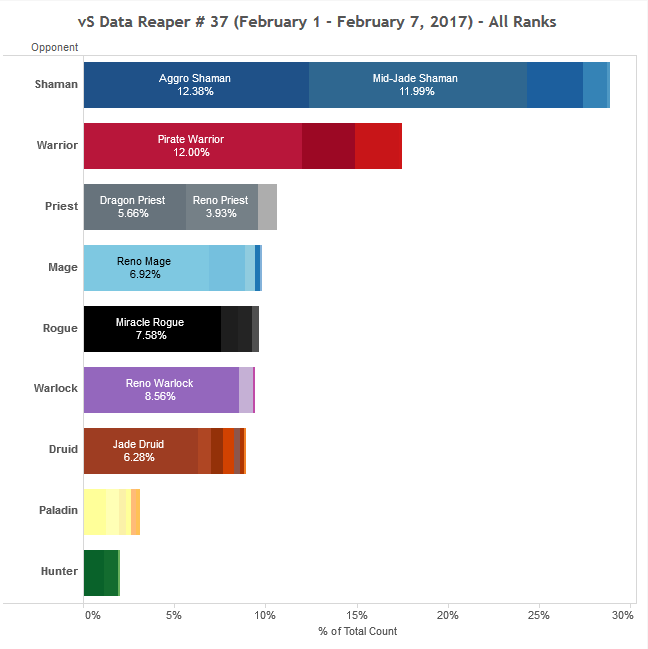 Welcome to the 37th edition of the Data Reaper Report! For your convenience, this report has been translated into the following languages: русский, 中文, and 한국어. Our Data Reaper Project, including the Data Reaper Live (Beta) has 2,400 active contributors. Without them, this project would not be possible, so we’d like to thank all of our contributors for their help. 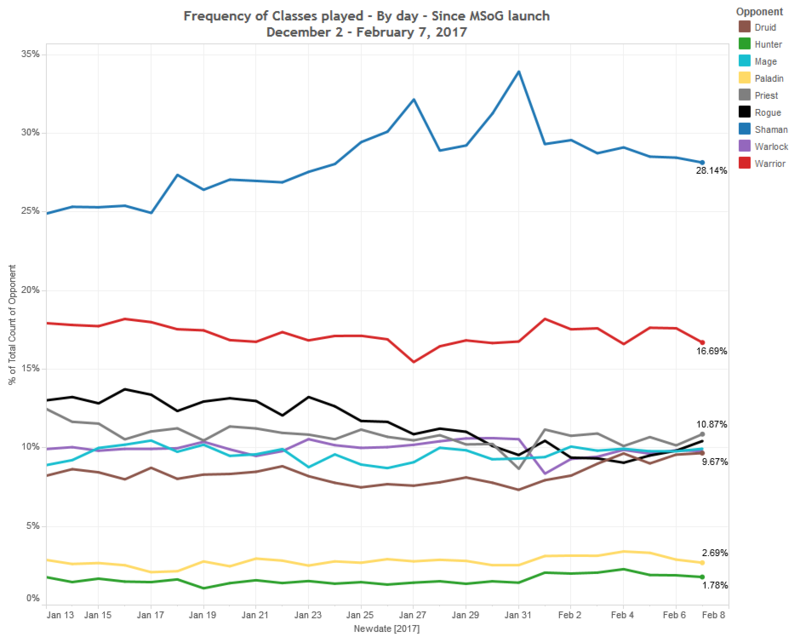 Typical of a new season, the first week usually exhibits a slight drop in the play rate of the top class. It’s worth noting that within the class, Mid-Jade Shaman numbers continue to increase. At higher levels of play, Shaman numbers remain extremely high, nearing 40% once you hit rank 5. Priest is seeing high play rates at low ranks, but its numbers drastically drop as you climb the ranks, where it gets seen even less frequently than Druid. This correlates with the diminishing performance of Dragon Priest at higher skill levels that we’ve observed in past reports. The Rogue hype is certainly gone. 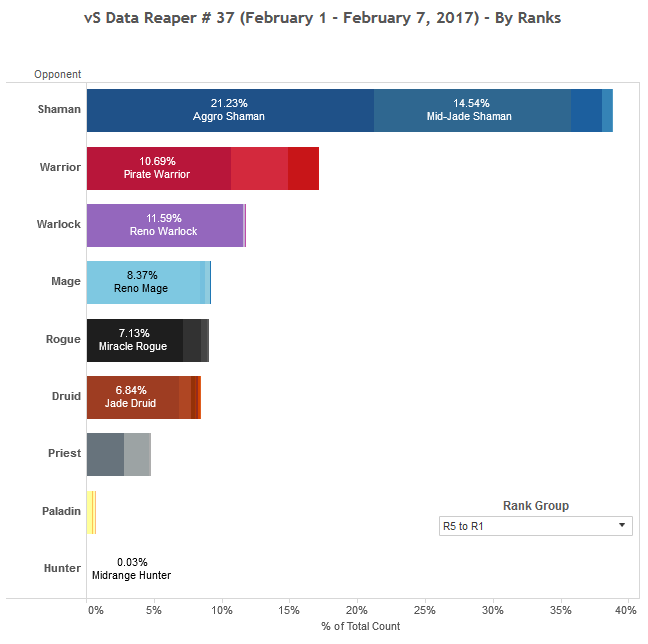 While the class is in a better state than others, it seems that the player population is losing faith in Miracle Rogue when it comes to ladder play, and it’s sinking into mediocrity. 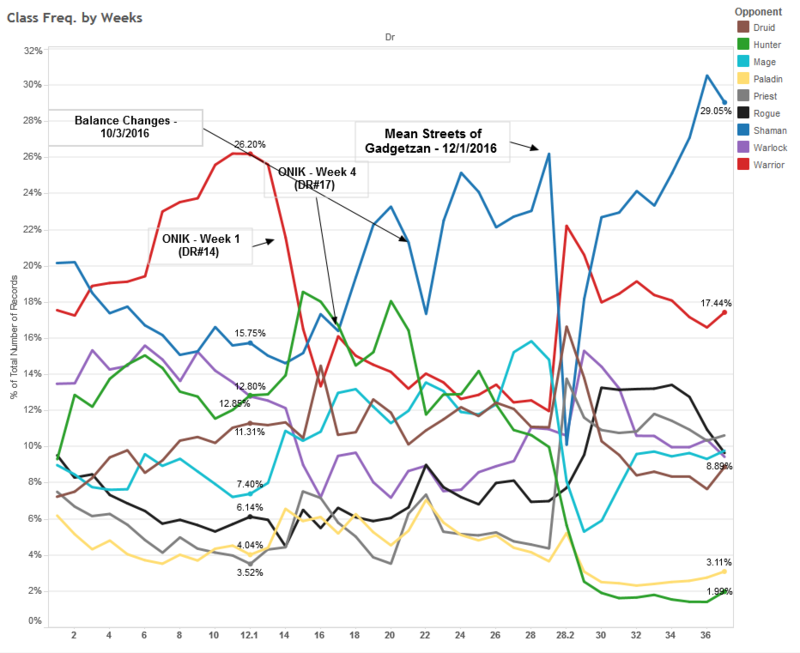 We can no longer observe the relatively increased play rate at higher levels that we’ve seen from the archetype over the past few weeks either. Reno Mage and Reno Warlock are the only control decks that seem capable of challenging Shaman and both have a respectable presence at higher levels of play. However, both have seen slightly reduced play rates during the first week of the month. This is a result of players looking to climb up the ranks quickly, which makes aggro counters less present during the climb, leading to aggro being even more efficient for ladder play. Food for thought. For some reason we cannot grasp, Druid has risen in play, and Jade Druid is quite present at higher levels of play too. The only thing this archetype does is make sure Shaman stays on top by drastically reducing the efficiency of its counters while giving it free wins. It is one of the most underestimated toxic elements of the current Meta even at its relatively low representation because of how polarizing its matchups are. Think of all the kittens!!! Since it’s the beginning of the season, we’ve applied legend win rates to the rank 5-1 table for this week, to get a more accurate picture of the current Meta at higher levels of play. Aggro Shaman stays on top. It’s gotten even better during the early climb for the reasons we mentioned earlier: players are not incentivized to play its counters at the beginning of the season due to time efficiency. At higher levels of play, it encounters more of its Meta rivals, so it sits between the 53% and 54% win rate marks. Mid-Jade is slowly establishing itself as the 2nd best deck in the game. It complements Aggro Shaman since it’s a good answer to decks looking to counter it, such as Reno Mage and Control Warrior (the latter gets obliterated by Mid-Jade which is why the archetype looks so weak at the moment). This is why the Meta is unlikely to move away from Shaman, since it’s so easy for the class to re-adjust in response to whatever is thrown at it. Aggro Shaman’s best counters are decks that have a high amount of life gain and removal, two mechanics that aren’t as effective against Mid-Jade Shaman’s incredible longevity and high threat density. Reno Mage and Reno Warlock sit just below the two Shaman decks as well as Pirate Warrior. Reno Mage is the most well rounded counter to Aggro Shaman, while Reno Warlock has seen resurgence in its performance recently for three reasons. 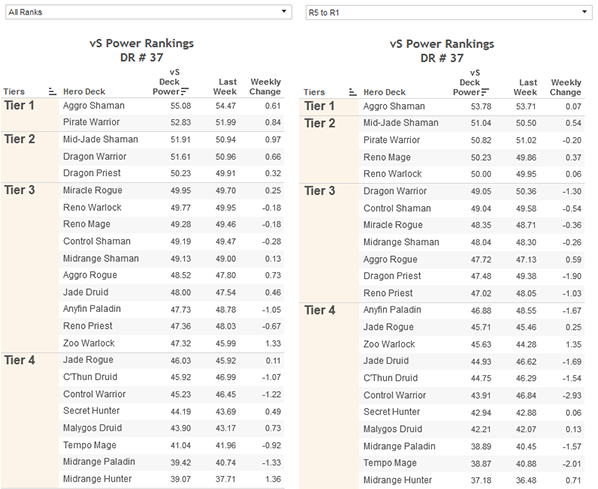 It is the strongest counter to the rising Mid-Jade Shamans, it no longer suffers from oppressive levels of its most dominant counter in Miracle Rogue, and players have recently made adjustments in Reno Warlock builds to improve matchups against aggressive decks, which correlate to improvements in these matchups according to our metrics. Shaman continues to be the dominant force in Hearthstone. 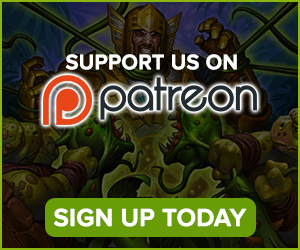 The class’ two main archetypes are the pillars of the current Meta: Aggro Shaman and Mid-Jade Shaman. Aggro Shaman has dominated the Meta since very early on in the expansion’s life, with Spo’s concept of merging the Jade mechanic with the Pirate package being the building block upon which all iterations are based on. Tyler’s build, with which he placed high on the legend ladder on three different servers last month, is the current standard due to the importance of two Maelstrom Portals in the mirror and other aggressive matchups. Mid-Jade Shaman has seen a surge in play over the past few weeks, which is attributed to Lifecoach’s innovation, with recent iterations being all-in on the Jade mechanic. There are a couple of approaches to the archetype, with one including the Pirate package, and the second excluding the pirates and focusing more on AOE and healing. The first approach is stronger against Reno decks, while the second approach offers more comeback potential against aggressive decks. This week, we are featuring SomiTequila’s build, which he used to finish #1 legend on the EU server last month. His list runs 2 copies of Devolve, which has many applications across different matchups, and is particularly powerful against Miracle Rogue. The build also runs 4 AOE spells, which provide the deck with a consistent way to fend off aggressive board flooding. If that isn’t enough to give aggressive decks a difficult time, the build includes three sources of healing, with two Jinyu Waterspeakers as well as a Healing Wave. Warrior’s place as the number two class is solidified even more as Shaman pulls further away, while other classes fall behind slightly. Pirate Warrior stays in the mix as one of the top decks in the current Meta, though it does hit a wall when the number of Aggro Shamans becomes obscene. The time for innovation seems to be over, with Muzzy’s list remaining the gold standard. Dragon Warrior’s win rate is higher than its usage might suggest, with a very balanced matchup spread and few bad matchups. It does suffer from the redundancy effect due to Pirate Warrior being so dominant against the field, but it’s a very solid choice for ladder play and has some matchup advantages over its Pirate cousin, which probably merit more usage than it is getting. Control Warrior continues to see some play based on its favorable matchups against Aggro Shaman, Pirate Warrior and Miracle Rogue, but its miserable matchups against the rest of the field means it is a deck suited only to a very specific Meta, usually found at the very highest levels of play where Patches is extremely prevalent. JakePhinney hit rank 1 legend this month with a Control Warrior build very similar to Fibonacci’s, with Yogg-Saron replacing Deathwing as the 10 mana comeback card. At the lower ranks, everyone seems to still have faith in the Priest class in a whole, but from rank 5 to legend, Priest continues to fall in overall use. It’s an inherently strong class, just like Jade Druid is strong, but these decks that would have been powerhouses in different Meta’s just can’t really seem to hang in this incredibly fast Meta. Priest is by no means Hunter or Paladin, or anywhere close to pre-Gadgetzan Priest bad, but the best decks are just that more powerful right now. In certain pockets of the Meta, Dragon Priest lists can do fairly alright. Hotform took a Dragon Reno variant to top 100 legend recently. The deck represents good matchups against Reno Mage and Aggro Shaman, so if you are often seeing these two decks it actually can perform quite well. In its current form, you have to be targeting specific decks within the Meta to have success with Priest on ladder. Paying attention to matchups and picking and choosing your time to climb is often going to be the more important aspect of your play while piloting the class. Reno Mage maintains its strong standing in the current Meta, with favorable matchups against two of the most popular decks in Aggro Shaman and Pirate Warrior. 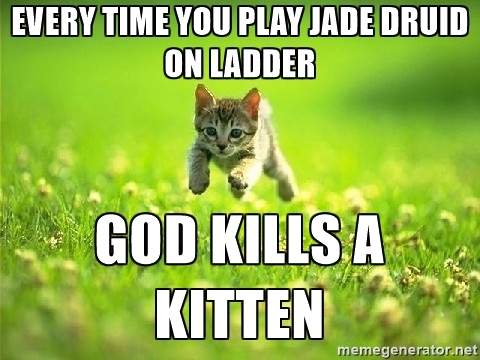 However, the increased presence of Mid-Jade Shamans is making ladder a more challenging affair. Unlike Aggro Shaman, Mid-Jade is much more difficult to exhaust of resources due to the deck’s incredible longevity and sheer number of threats. In addition, the Mid-Jade Shaman usually packs plenty of healing, which makes it more difficult for cycle/burn builds of Reno Mage to finish off the game. Reno Mage continues to have two main approaches, ranging from value centric builds such as JAB’s, to combo/cycle centric builds best represented by Noblord’s list. While Tempo Mage continues to gain popularity in the open tournament Meta, that potential has failed to be realized on ladder. It is a deck that is currently far more popular at the lower ranks of ladder. This is mostly due to the deck’s terrible matchup against Shaman, but we wouldn’t be surprised if the archetype pops up during the upcoming preliminaries. It’s the start of a new month and Valeera finds herself in a very peculiar spot. While Miracle Rogue is fantastic at exploiting slow and experimental decks we tend to see at this time of the season, it doesn’t do very well against Aggro Shaman and Pirate Warrior – fast and aggressive decks that many players choose for their early month Legend climb. With the current cards, it is very hard to tech Miracle Rogue to do better against aggro decks. One copy of Dark Iron Skulker can provide a powerful swing in the midgame, but the class’ general lack of comeback mechanics force it into the all-in playstyle it exhibits these days. The Questing build has been the standard build for a while, and the win condition against aggro decks is either a Van Cleef/Questing blowout or a race with Cold Blood and Conceal. Pirate Aggro Rogue is another option for Rogue enthusiasts that want to have a better matchup against aggressive decks – it cuts out Auctioneers and some of the reactive cards for a consistent early game that can snowball into a fast kill. Muzzy has recently updated his build, which now includes Shaku and Xaril, increasing the build’s longevity against control decks. Reno Warlock is in a relatively good spot in the current Meta due to reasons we’ve mentioned earlier in the article: the rise of Mid-Jade Shamans, the decline in Miracle Rogue and the internal shift in its own builds. Ladder builds have become less greedy, usually banking on Jaraxxus to carry out the late game plan. 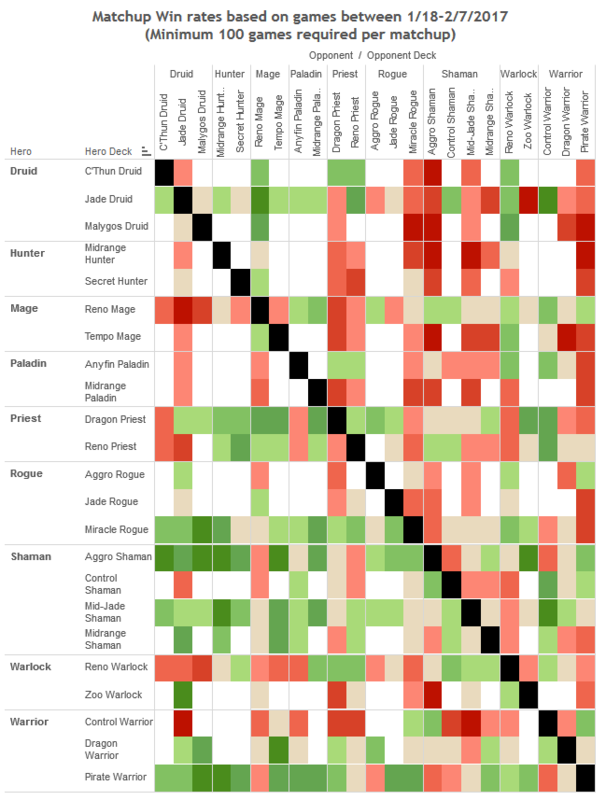 This has improved the archetype’s matchups against aggressive decks, which is a direction initially pioneered by players such as StanCifka and Hoej. xMrSouldx, a Chilean player, won the AM legend race using a Reno Warlock on the greedier side of the spectrum. His list is a fairly standard combo list that omits Mistress of Mixtures for Soulfire. Zlsjs also hit legend early in the season using a defensive Reno Warlock list very similar to Hoej’s, cutting Voidwalker and Frost Elemental for Shadowflame and Emperor Thaurissan. The main advantage of having the Leeroy combo is in the mirror and in a matchup like Jade Druid where you need to actively kill your opponent, while cutting these situational cards should improve your results against aggressive decks. Druid is a much more viable pick in the tournament scene than on ladder, due to its extremely polarizing matchups spread. Both Jade Druid and the multiple variants of the Aviana Kun lists are favored against the slower Reno and control decks, but suffer from the lightning-fast starts of the Patches decks. Most players are choosing to play Jade Druid in the tournament scene rather than the Aviana-Kun combo builds, due to its higher consistency. With slow Druid builds mostly failing on ladder, many players are trying to make Druid work by speeding it up. 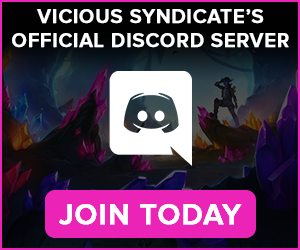 J4ckieChan’s Egg Druid has seen an increase in play, while Thijs has experimented with Beast Druid to decent success on ladder. Feno’s Menagerie Druid is also an option if you’d like to take an aggressive approach to the class, but all of these builds remain quite niche and have yet to establish a spot in the current Meta. There’s no reason to play Paladin until Blizzard releases their next wave of balance changes. The ladder Meta is mostly solved, and it doesn’t include Paladin. The class does not have the tools to withstand Shaman or Pirates, and that’s pretty much the end of the story. 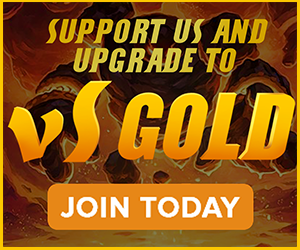 If you insist on playing Paladin on ladder, you will probably want to play Anyfin Paladin, and you would want to consider the anti-aggro oriented lists of MrYagut or Senfglas. If you’re crafting a line-up for a tournament, Anyfin Paladin becomes a much stronger choice than it is for ladder. The deck is anti-control at its core, so you’d want to look at a more traditional list like Thijs’ if you’re playing the deck for that purpose. Zalae is one of the few people even attempting to play Hunter right now. Last week, we showcased his Reno Hunter build, and this week he went a different route with a Control Hunter list that includes the Barnes-Y’Shaarj package, as well as two Call of the Wilds. The deck packs in as much removal as possible in hopes of reaching turn 9, where Call of the Wild can give a much needed tempo swing. Most notable about the list is the inclusion of Ragnaros. Although Rag tends to be worse off Barnes than getting Y’Shaarj, it gives the deck another threat to ensure there is enough value to take down Reno decks. In addition, by including a second potent Barnes target, you drastically reduce the number of games where Barnes is simply a four mana 3/4 due to drawing Y’Shaarj before it was played. Zalae’s variant of Barnes-Y’Shaarj Hunter performs better against control decks than NickChipper’s secret variant, but is more susceptible to Aggro, so NickChipper’s latest build is the best Hunter deck for the current Meta. At this point, it’s a bit difficult to keep this section fresh from one week to the next, but our observation is that the Meta revolves around the two top Shaman archetypes, and the two Reno archetypes built to counter them. Mastering how to play them and how to play against them will likely serve you well. Our Data Reaper Project, including the Data Reaper Live (Beta) has over 2,400 active contributors. Without them, this project would not be possible, so we’d like to thank all of our contributors for their help. Special thanks to Leo G., Chungfr, Kognar, Bill C., and Zach D. for supporting us for the month of February. Why don’t you include data for ranks lower thank 15? 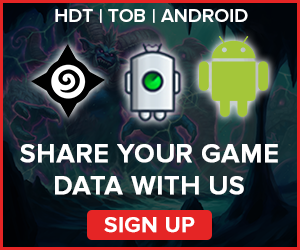 Most players will be included in that piece of data i guess. You say Pirate warrior is favorable for agro shaman but when I play this match up it’s always very close I win with less than 10hp or my opponent win with something like 1hp so I’d say slightly favorable but maybe it’s just me.